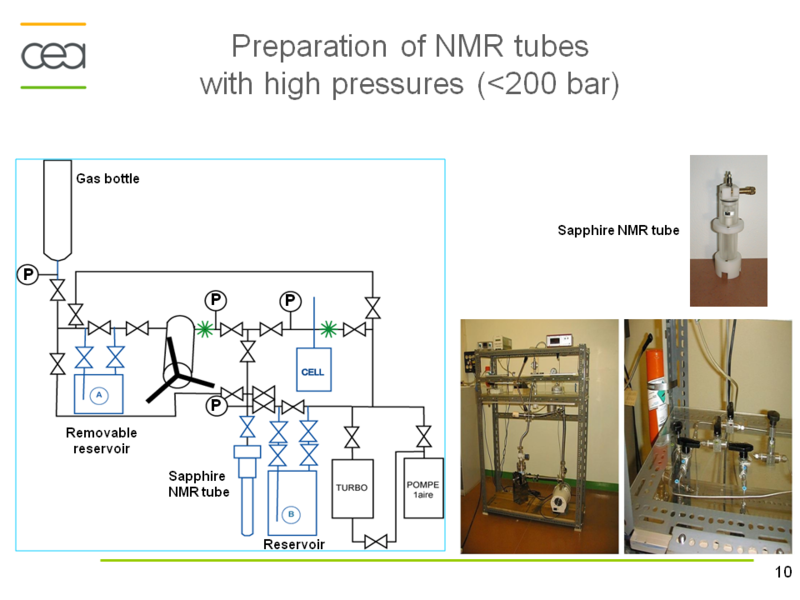 High resolution NMR fails in the case of large macromolecules (molecular size >35 kDa) due to slow tumbling which results in short relaxation time T2 and signal loss during pulse sequences, even for proteins enriched in stable isotopes (15N, 13C, 2H), and in spite of the experiments using cross correlation effects (TROSY, CRINEPT). A solution proposed by Wand et al. to decrease significantly the rotational correlation time and thus the linewidth consists in the encapsulation of proteins within the water cavity formed by reverse micelles in low viscosity apolar solvents. In sub-critical regime, the viscosity of some apolar solvents is several orders lower than that of water. The reverse micelles may encapsulate proteins in low-viscosity fluids such as short chain alkanes and noble gases (Xe), CO2. The formation and the size of these aggregates largely depend on the ratio [H2O]/[surfactant], on the nature of the surfactant and its solubility in non-polar solvents. Anionic, cationic or nonionic reverse micelles very often lead to a structural alteration of proteins. For a basic protein like cytochrome-C (pI=10.2), due to strong electrostatic interactions between the protein and the negatively charged layer of AOT, the protein is located in the interfacial region of the reverse micelle. Our novel class of zwitterionic surfactants is able to encapsulate in reverse micelle proteins of low or high isoelectric points without major modification (denaturation or aggregation) of the native structure in short chain alkanes. 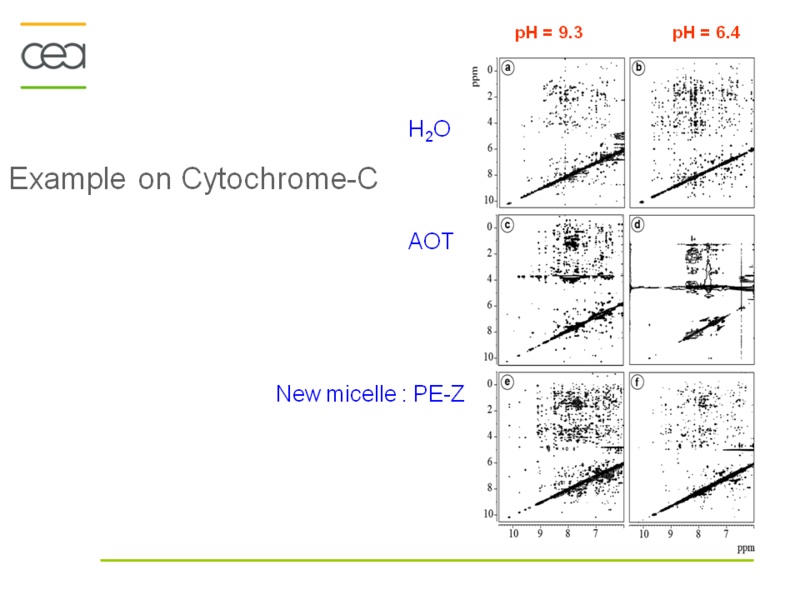 Charge redistribution according to the protein suface potential is avoided. 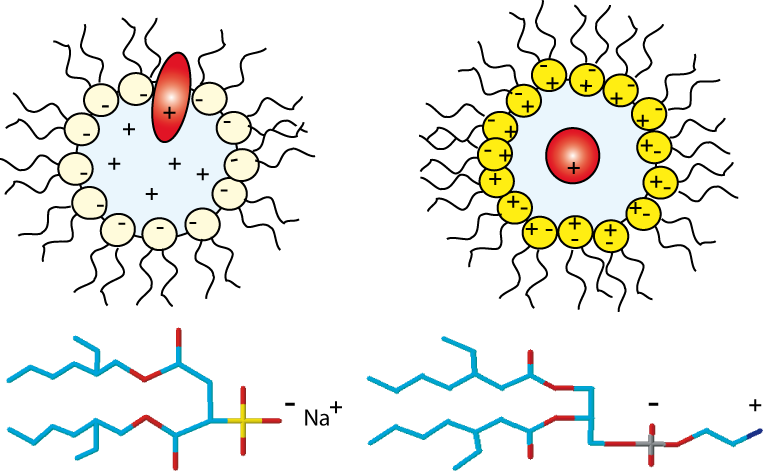 Protein-micelle interactions are less strong than with other ionic surfactants. Encapsulation of ubiquitin and cytochrome-C in ethane/propane/pentane mixtures is achieved without addition of salts or buffer. The reverse micelles are stable over a long period and don't need co-surfactant or co-solvent. Wand A. J.,. Ehrhardt M.R., and Flynn P.F., Proc. Nat. Acad. Sci. USA, 95(1998) 15299 - 15302.